When remodeling your bathroom, it can be too easy to go down the simple and plain path just to get the job done. All-white lavatories can be painted quickly, and you know that you can find a bathroom vanity in this nondescript shade. However, bolder amateur designers should stray from the norm and consider an industrial-style bathroom for something a bit more funky and interesting. If you're looking to marry an industrial vibe with something a bit more vintage, you might consider a claw foot tub. According to Decoist, which profiled one Brooklyn-based industrial bathroom, you can find a model in monochrome colours, which will eliminate the old-Hollywood feeling of a more traditional tub with this kind of feet. If you're looking for something entirely industrial, seek out a stand-alone bathtub or one in an unusual shape. To find the perfect place to bathe, stop by a kitchen and bath showroom so professionals can show you what is possible within your budget and space constraints. 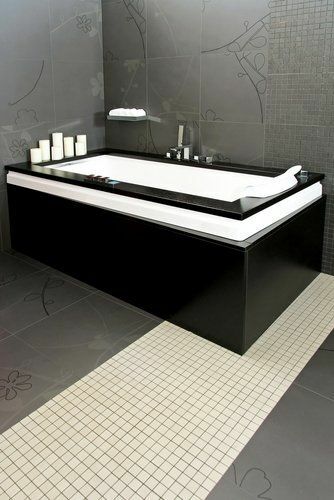 Look for a granite or black tub for an industrial feel. Anything steel can lend an industrial aura to your bathroom, so feel free to look for vanities and cabinets that have brushed steel handles – or that are actually made of the material. In terms of the rest of the decor, Houzz featured several bathrooms decked out in black and white. Subway tile around the room was paired with large glass panes in the shower. These panes were square in shape, and each one was surrounded by black trim. The overall effect presented a curious starkness that evoked a city or former factory. If possible, you can couple this look with a granite sink. Go ahead and pair up this kind of tile with any black trim or a black marble countertop to complete the industrial feel. You can also look for shower curtain rods in a brushed black metal to complete the utilitarian vibe, like some of the others highlighted by the source. An industrial-themed bathroom can look extremely modern and polished. Take your inspiration from the geometry of the city, a refurbished factory, and other utilitarian edifices, and your room will certainly shine.